There are several things that I hope to achieve in the future, which are actually still quite vague. First, putting it simply, I hope to become someone who is internationally active. Perhaps, I could achieve this by working for a foreign multinational company. I have one major reason as to why this is a realistic and appealing future for me. It is that I want to have a working environment where “typical Japanese values of working” is non-existent. This is the reason why foreign multinational company is the most preferable alternative, and not Japanese company. As Allison (2013) illustrates, in contemporary Japan, labor is continual and tends to merge with one’s life (p. 16). However, I hope to clearly draw a line between work and personal life. Through the experience of living in Belgium for 5 years, I found that the average working class in Belgium are able to separate their jobs and personal lives, which is a trend I hardly see in Japanese society. For instance, their priority is spending a time with their family, and hierarchical relationship at their workplace rarely affects their personal lives. To put it differently, I am attracted to the Western values when it comes to working environment. It is not that I want to run away from the precarity in Japan and I am aware that my generation has to face the current situation and live through the hard time. However, forecasting its future from present situation frightens me. For example, the LDP is now trying to pass a labor legislation that will abolish working limit and obligation for the companies to provide their workers days off (Kanetani 2014). Such a policymaking is believed to increase the number of overwork deaths and it could worsen the precarity issue. This is another reason why I would like to work in an international environment. Another goal is to have a family and let them have the same quality of life as I currently do, thanks to my father. What is important is that, in my life, I’ve always had a choice and never been coerced to choose certain path, which I believe is only possible due to a stable source of income. In other words, I do not want my future kids to be in a situation where having a precarious job is the only option. I believe that in the future, family will always be my ibasho, as it always has been. Ibasho, in my opinion, is a place that one can always “save” and go back to regardless of time. My friends from high school, or even from elementary school, have always been my ibasho where I can feel like a worthy individual. I believe it can be meaningful to place importance on keeping in touch with old friends and having “tsunagari”, because these would provide an individual more ibasho (Allison 2013, p. 20). I feel that it would be wonderful if I was able to have my workplace as my ibasyo where I have a good human relationship and am able to show my ability to the fullest. This way, working will not be something too stressful. In conclusion, my future is still unclear and my plan is mostly based on the idea of “how to avoid precarity.” For this reason, in a next few years, I hope to find myself a clear future goal, so that I will be able to work on my own initiative to achieve that goal. To be honest, I am quite optimistic about my future career. And preferably, I would like not to become a part of the precarious society, but become a leading force to solve this issue. Allison, A. (2013). Precarious Japan. (pp. 16-20). Duke University Press. 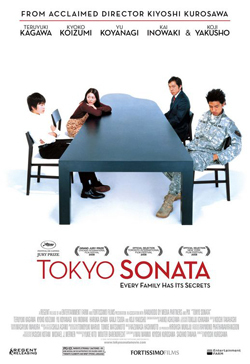 In her book Precarious Japan, Anne Alison discusses the depiction of precarious life in the film “Tokyo Sonata.” In the ensuring paragraphs, this paper introduces “Tokyo Sonata” first, and after that, Allison’s view of “Tokyo Sonata” is analyzed, and my opinion on the movie and Allison’s view comes in the final part. First of all, this movie starts with the situation that one man loses his job, and the movie shows the family’s life in which the father struggles with hiding the truth about his job. After all, family got to know that he lost his job. About this movie, Allison says there are also other stories of his sons and wife. They all face some problems and complicated and awkward situations; all members of the family have problems but they gather around the table and eat dinner in almost silence. According to Allison, this family represents muenshakai (relationless society) in which disconnectedness and incommunicativeness are occurring. She writes “No one speaks and no one knows, or asks, why the others look a mess” in his family, and her point is actually shown in his family. Also, Allison claims that the house can be a tool for analyzing the soul. In “Tokyo Sonata,” the soul of the family can be seen when the house actually plays the role of “house” which means the place for family members. My opinion is for my contemporary situation, I really cannot imagine if I was fired while having a family. I may try to find another job while pretending to go work. However, as for muenkazoku (relationless family), I also cannot imagine how I would manage family as father, but from my experience, love is the most important element in family and this should be shown as a form. In order to show love as father even mother, relationship have to be a big deal. This means that a family thinking love is relationship in a family must not be involved in muenshakai. The truth, however, is there are a number of relationless families in contemporary Japan, according to Allison. Like Allison points out, the cause of these families is market capitalism. Mentally, this market system makes the family, especially the father, think he has to focus on work in order to take care of his family. Then the mother thinks she is supposed to focus on housework and grow up sons or daughters. Therefore, to put it simply, muenshakai (relationless society) is a by-product of overly developed capitalism, I think. It should be required not to change market capitalism, but to give rise to solutions like improving the welfare system, which directly leads to people’s happiness while we keep capitalism. Anyway, the government should be involved to make a change in our society. Will Miku give us hope? Hatsune Miku (初音ミク) has become a boom all over the world. 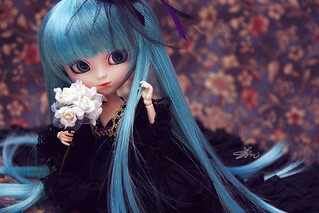 Like the 2-D fetish or imaginary girlfriend of otaku, she is a digital character who sings with a human voice if people set music to it. Users can set the size of her body, so they can each have their own Miku. 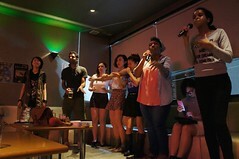 According to Bendako (2012), because users can make her move and sing, she is seen as satisfying their fantasy love, such as by saying “I love you” to them. Users can also create music and dance to make her do, and then upload it to the Internet. Following this, the most important reason for the boom is that although she cannot be felt as a human idol, she can imitate a normal human being to encourage users if they create good music, and communicate with them to make users feel happy (Bendako 2012). Miku has fulfilled what Allison said, that “human and the robot to understand each other like human beings” (Allison 2013:102). There came up a heart to heart relationship between Miku and users. 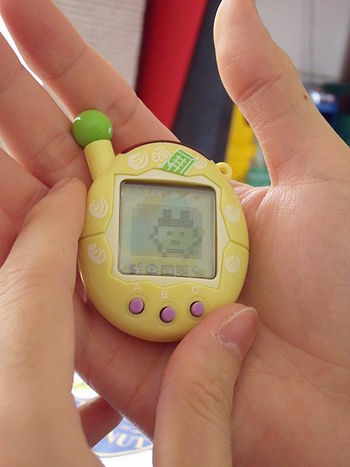 Around 20 years ago, the virtual pet, Tamagotchi, was very popular for people who wanted to experience keeping a pet. People take care of digital pets for fun when they are free, to feel warm when they feel tired, but they can stop and restart whenever they want. No matter whether it’s Miku or Tamagotchi, they are all the productions of prosthetic sociality. They are electronic goods, but we can communicate with them and they can affect us. Although they are digital, the relationship between human and them does exist. Especially with the development of technology, the electronic goods that accompanied people have changed from a pet in a special electronic screen to a lovely, humanlike girl in computers, PSP, even people can see live performances by Miku on real stages. Moreover, people can use the Internet to share their own Miku music and dance to the world. Users can also get communication through Miku. It is said that these humanoid robots can help “promote companionship and communication” (Allison 2013:102). However, how about the real lives of people who feel healed by prosthetic sociality? The interesting phenomenon in Japan is that compared to the overflowed information on the Internet, Japanese society is lacking in communication and humanity. People are interested in saying things on the Internet, but refuse to communicate with their families and neighbors. I totally agree with Allison’s criticism that prosthetic society will weaken “human ties in the family, workplace, and community” (Allison 2013:101). The bad effect is appearing, and I myself am an example. My parents were very busy and had no time to take care of me, so they bought me a DVD player. Maybe they thought it was good for me to have a companion, like the mother is happy for her five-year-old son to have a Tamagotchi. However, I just repeated watching DVDs and wanted to be a good child to not be a nuisance (mendokusai). Now when I looked back over my childhood, I prefer being a bad child to having more touch with my parents. Due to that, I am afraid that I will become a user of care robotics, as I grow old. I do not want to taste loneliness again. Prosthetic sociality will not save people. It is like a drug, which can make people happy temporarily, but the side effect, feeling lonelier, will continue in the future. People will grow older. The day when they get out of the prosthetic sociality will come, but they cannot find any connection with others at that time. People relay on digital life maybe because their parents or friends cannot give them more care or touch, or they shut down their family life themselves. However, as a result, escaping from the reality is not a good choice. I appreciate Tamura Hiroshi and others, who can face to the difficulties of life. The prosthetic society can be a good entertainment, but will not give us hope. Hatsune Miku joins LINE Play! Last week, we watched a movie, “Tokyo Sonata“. When I watched the movie, I found that this movie may not only tell us “The real of people who have no job” but also “muen shakai”. I’ll talk about meaning of this movie with Anne Allison’s opinion. “For this era of sarariman Japanese, was where one “belonged” and got socially nested.” Alison said in the book Precarious Japan. In the movie Tokyo Sonata, Kurosawa, who is the leading character in the movie, had an “ordinary” Japanese family and an “ordinary” job. But when he lost his job, simultaneously he lost sight of his life by degrees. We may think and know life is not only to work, however, it is not easy to say we can find happy without working in Japan. Kurosawa’s losing job leaded some problems in his family. When I watched this movie, at first, I thought this family was normal like my family. But I know that “ordinary” is not “normal”. I think Japanese are possessed with the idea that men must work, women must do household affairs and children must go school and university. But this is not the only style to live. Maybe Kurosawa believed he must work and working was only his purpose, so he lost job, he gave up hope and his family began breaking down. Alison said, “This is a movie about what is ordinary in the (de)sociality – disconnectedness, intercommunicates – of Japan’s muen shakai. Families where no one speaks; communities where a long time resigned can starve to death without seeking or receiving help from a neighbor next door”. And she pointed out stronger muen shakai even if they have family or their own home than jobless. I realized and am surprised that if we have home, family and money, we have a dangerous part in muen shakai. In this movie, Kurokawa family can eat food and children can go to school and somewhere, but their communication is poor, and I felt they didn’t look like happy. In the last of this movie, members of Kurosawa family found their own way to live. I think they broke down the old way the had lived as “ordinary” family. To be out of ordinary life, they got real happy. This movie told me many problems in Japan, especially in family and the importance of breaking out of the loop days. I now go university, however, I realized it is not important to go university, but it is important to realize the real thing I want to do. After watching this movie, I was able to know ordinary isn’t only way to live. Author Anne Allison created the concepts techno-intimacy and prosthetic sociality when she heard “if I don’t feed it, the dog dies. It’s utterly dependent on me.” (2013:101). The definition of prosthetic sociality is “electronic goods that attach to the body and keep users continuously plugged into circuits for information, communication and affect” (2013:101). Allison mentioned that in present Japanese society, family ties have become weaker and weaker. Tamagotchi can describe how the Japanese family ties is in the present situation. As you may know that, to keep the game of the Tamagotchi, the player has to keep feeding until the pet in the screen died. Someone have to continue feeding the Tamagotchi so it will not be starved. Techno-intimacy or prosthetic sociality is, of course, an issue in the present Japanese society. One of the example is the starvation incidents (2013:103). As the author pointed out, “the incident has triggered warning bells all over again of the ‘heartlessness’ of the times and a society that has lost its humanity. A situation of life and death, of mendo (care of daily living) coming undone.” (p.p. 103). Weakening the ties with own family and community has been outstanding by the incidents. Tamagotchi is back!!! My 8-year-old self rejoices! I think that the concept of “global affective labor” means job related to moods, feelings and attitudes such as maid cafe, hostess or cat cafe. It has some effects on our emotions such as healing, moe or relief. I think that there are original examples in Japan. At first, “maiko” is a geisha who learns or receives training in Japanese dance or song. They wear kimono and make up whitewashed. We are entertained with Japanese banquets. This is a traditional culture in Japan. Next, CA (cabin attendant) is an occupation that works in an airport or on a plane. Many of them are beautiful or pretty women. They wear short skirts or stylish uniforms. They usually provide passengers drink and food with smiles. So they take care of passengers during flight. These jobs usually need some selections, many trainings or practices. There are many imaginable reasons why people pay for affection from those jobs. I think that people want ibasho or to escape the reality. It is involved in some factors such as thin connection to family or friends. They may not have ibasho where talk their daily life or some distress and to find them necessary. Everyone needs ibasho, identity, affiliation. As a result, they go to those places to heal their feelings. It may lead to thin connection to other people. In addition, they may feel the connection to other people is “mendokusai”. Anne Allison (2013) also says “the breakdown or liquidization of the relationship between human time and capitalist value at the level of the (re)productive family home”. I agree with her analysis. As time passes, the various trends change in Japan. For example, there is the trend toward late marrying or not marrying recently. Young people think that marriage is mendokusai. Thin connection to other people may cause this feeling. The family corporate system also has changed. Both women and men work recently. As working every day, they need to care give or raise children. Some children tends to eat pre-pared dishes alone at home. As a result, there is also less communication between families. I think that existing many global affective labor is related to relationships or connections to family, friends or other people. In addition, ibasho is also related to these sources. I think that ibasho is important for us. “Japanese are living more solitary existences, apart from others [tanin]. Communication is lacking these days.” So it is caused thin connection to other people. We have to rethink our relationships and this problem. Why are so many Japanese men refusing to leave their rooms?